A new book of photographs curated, cropped, and digitally reprocessed by Michael Benson (previously mentioned on BLDGBLOG here) has been reviewed by the New York Times as something you could flip through "for hours and never be bored by the shapes, colors and textures into which cosmic creation can arrange itself." 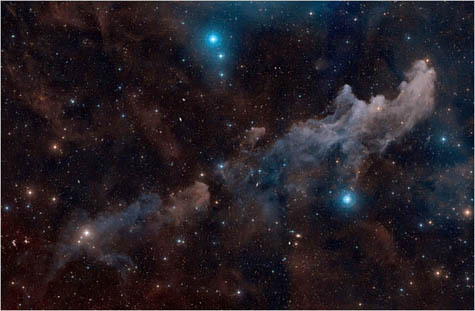 The book shows us "stars packed like golden sand, gas combed in delicate blue threads, piled into burgundy thunderheads and carved into sinuous rilles and ribbons, and galaxies clotted with star clusters dancing like spiders on the ceiling." 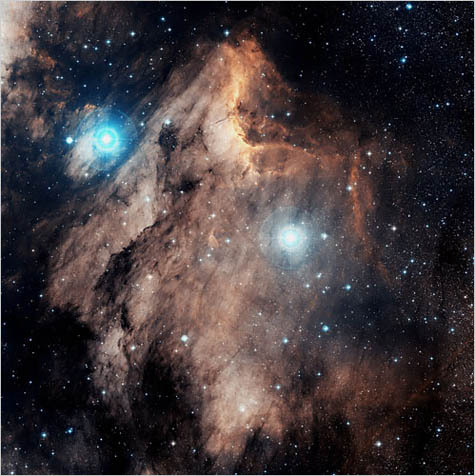 The above image of the Pelican Nebula, photographed by Charles Shahar at Caltech's Palomar Observatory, brings to mind the later sky studies and weather paintings of John Constable, in particular Constable's Seascape Study with Rain Cloud (1827). 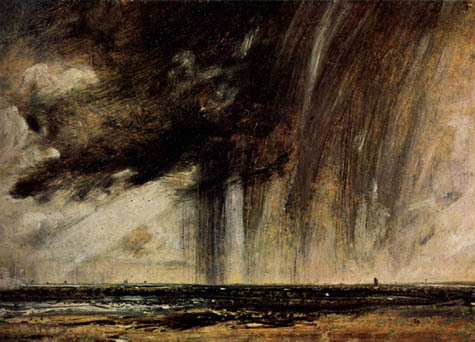 As if there are nebulas here on earth with us, moving through the sky (and through art history). 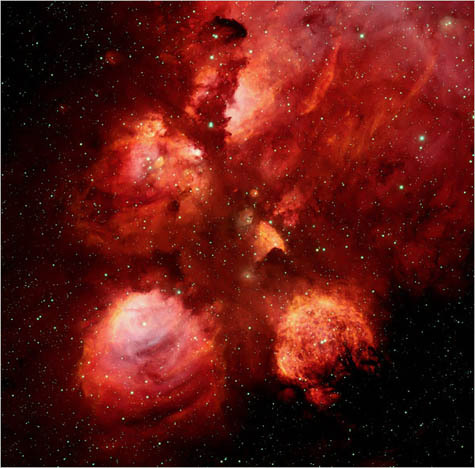 [Images: (top) The bewilderingly beautiful Cat's Paw Nebula, photographed by T.A. Rector at the University of Alaska, Anchorage; (middle) The Witch Head Nebula, photographed by Davide De Martin at the Palomar Observatory; (bottom) The Rosette Nebula, photographed by J.C. Cuillandre (Canada France Hawaii Telescope) and Giovanni Anselmi (Coelum Astronomia)]. 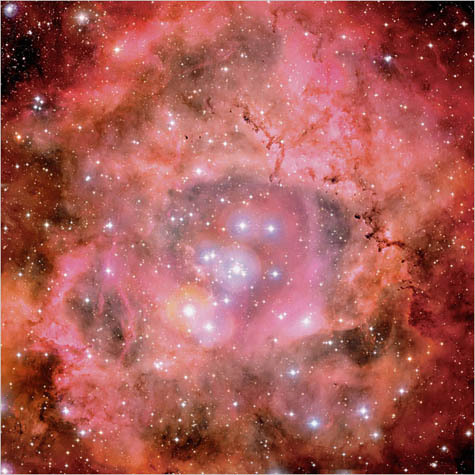 That final image shows us "3000 cubic light years of gas... heated to a temperature of over 10 million degrees Fahrenheit." To my discredit, I have never thought of volumes of space in terms of "cubic light years" before—it's an extraordinary unit of measurement. Perhaps someday it could even be applied to data: teraflops be damned, our harddrives will be filled with cubic light years of information. lightyear is a unit of physical distance, teraflops are units of performance (floating point operations per second), hard drives are filled with units of data - usually *byte or *bit. somehow I don't see hard sciences ever interchanging units like that. though there probably will be a comparable vastness in the *byte family some day. the question may be, after the atomic transistor size limit is solved, what will yottabyte flash drives look like? I'm astonished and amazed by what these images represent - I just don't like the heavy colorization . . . . .